Encounter a land of extraordinary beauty and belief, of spirit and story, history and hospitality. From modern Tel Aviv to scen­ic Upper Galilee, ancient Tiberias and storied Nazareth to Jerusalem, “City of Gold,” we engage all our senses in a small group encounter with this extraordinary and holy land, with a five-night stay in Jerusalem at the legendary King David hotel. Day 2: Arrive Tel Aviv We arrive today and transfer to our hotel. As guests’ arrival times may vary greatly, we have no group activities or meals planned and are at leisure to explore or relax as we wish. Please note: This trip involves considerable walking on uneven or cobblestone streets and at sites of ancient ruins. You should be in good physical condition to enjoy the tour to the fullest. Please call if your city is not listed or for land only prices. Prices are per person based on double occupancy and include airline taxes, surcharges, and fees of $789, which are subject to change until final payment is made. Single travelers please add $1,795. Your $375 deposit is fully refundable up to 95 days prior to departure. All 2019 tour prices above (excluding airline taxes, surcharges, and fees) are guaranteed. While this tour does not require a visa, a visa is required for the optional extension. Odysseys Unlimited will provide information about visa requirements upon reservation. A member of Leading Hotels of the World, Hotel Dan Tel Aviv sits on the city’s lively seafront promenade and close to the business district and main attractions. The hotel has two restaurants and a bar/lounge; several shops and boutiques, including an art gallery and antiques shop; beauty salon; complimentary Wi-Fi internet access; laundry and dry cleaning services; and safe deposit boxes. Recreational facilities include an indoor freshwater pool; outdoor seawater pool; sun deck; fitness center; and spa with Jacuzzi, massage, and sauna. Guest rooms have private bath with hair dryer, minibar, TV, and phone. Located in Kibbutz Hagroshrim, some 40 minutes north of the Sea of Galilee, Hagoshrim Hotel & Nature offers a lovely and comfortable retreat in Israel’s northeastern corner. The hotel was built on the ruins of an Ottoman winter palace and sits surrounded by gardens, greenery, and small streams. Amenities include a restaurant, lobby bar, health and sports center, indoor and outdoor swimming pools, full spa with a range of treatments, and complimentary Wi-Fi internet access. Air-conditioned guest rooms are decorated in bright, welcoming tones and offer private bath with hair dryer, coffee-making facilities, TV, and phone. Sitting directly in the center of Tiberias fronting the Sea of Galilee, the unique Scots Hotel was founded as a hospital in the 19th century by Dr. David Watt Torrance, a young Scotsman dedicated to serving all peoples of the Holy Land. Now owned by the Church of Scotland and converted to a 50-room boutique property in 1999 (the hospital closed in the 1950s), the hotel aims to “provide first class service in a place of reconciliation for all people, including Jews, Christians, and Muslims …” in keeping with Dr. Torrance’s beliefs. Indeed, in addition to its guests, the hotel’s staff is ethnically diverse as well. Hotel facilities include a restaurant and bar; complimentary Wi-Fi internet access; laundry and dry cleaning services; half-size Olympic outdoor pool and a beach garden with views of the Sea of Galilee and Golan Heights; an herb garden and ecological fish pond; spa; and gift shop with art and crafts created by local Jewish, Druze, Muslim, and Christian artists. Guest rooms have private bath with hair dryer, coffee-making facilities, in-room safe, minibar, TV, and phone. A landmark hotel steeped in history, the King David Jerusalem Hotel stands overlooking (and within easy walking distance of) the Old City. Equally accessible to Jerusalem’s lively downtown, Israel’s most famous and prestigious hotel makes an excellent base for exploring this fascinating city during our five-night stay. Built in 1931 of locally quarried pink limestone, the 237-room King David features spacious gardens with breathtaking views of the Old City; two restaurants and a bar; fitness center; outdoor swimming pool; tennis court; spa services; complimentary Wi-Fi internet access; laundry and dry cleaning services; and shopping arcade with gift and jewelry shops, art gallery, and beauty salon. Air-conditioned guest rooms have private bath with hair dryer, in-room safe, minibar, TV, and phone. Set amidst the rugged, rocky terrain of the Petra Valley, the Petra Marriott Hotel sits just a ten minute drive from the ancient city of Petra, one of the new Seven Wonders of the World. Amenities of the hotel include two restaurants, a bar/lounge, and an authentic Bedouin tent serving traditional cuisine and drinks (open May-September); outdoor swimming pool; spa with sauna, massage, and steam room (for a fee); complimentary Wi-Fi internet access in public areas; and laundry service (for a fee). Air-conditioned guest rooms have private bath with hair dryer, in-room safe, tea- and coffee-making facilities, minibar, TV, and phone. The Amman Marriott Hotel sits in the heart of downtown Amman, offering an ideal location from which to explore Jordan’s historic capital. This stylish and comfortable hotel offers four restaurants (American, Italian, Mediterranean, and a gourmet restaurant/cigar bar) and a piano lounge; both indoor and outdoor swimming pools; fitness center; sauna; laundry service (for a fee); and complimentary Wi-Fi internet access in public areas. Each air-conditioned guest room includes private bath with hair dryer, tea- and coffee-making facilities, minibar, in-room safe, TV, and phone. Discover the “rose-red city, half as old as time” on this exciting exploration. Plus: the capital of Amman. A popular history by the author of A History of God. Armstrong tackles big subjects – and this book is no exception. It’s a comprehensive, concise portrait of the city over the last 5,000 years. In this compelling volume, Israeli novelist Amos Oz interviewed dozens of his fellow countrymen from all walks of life. A passionate, candid and diverse portrait of a people and their hopes, fears and prejudices. Israeli journalist and New Yorker contributor Ari Shavit delves into the history of Israel, its founding pioneers, his own family and, critically, Israel’s legacy of occupation, which he puts at the center of this penetrating memoir. This compact illustrated guide provides a thorough overview of Israel and western Jordan, including Petra, Wadi Rum and Amman. A double-sided, indexed map at a scale of 1:150,000. This durable, foldout card gives easy phonetic pronunciation for several hundred of the most commonly-needed words and phrases. Yotam Ottolenghi and Sami Tamimi return to the city of their youth in this remarkable culinary tribute, including traditional age-old dishes, inspired modern recipes, tales of childhood and essays on the flavors and complexity of Jerusalem. With evocative photographs and 120 recipes that you’ll want to try. Succinctly sketching the history, religious traditions and practice of Judaism. An illuminating and heartfelt exploration of the complex Middle East. Pulitzer Prize-winner Friedman provides a personal and a scholarly perspective on the roots of the conflict. Beginning in 1881 with the emergence of the Zionist movement, eminent Israeli historian Anita Shapira chronicles Israel’s history through its nation-building in the ’50s and ’60s to years of stalemate and hope in the late 20th century. 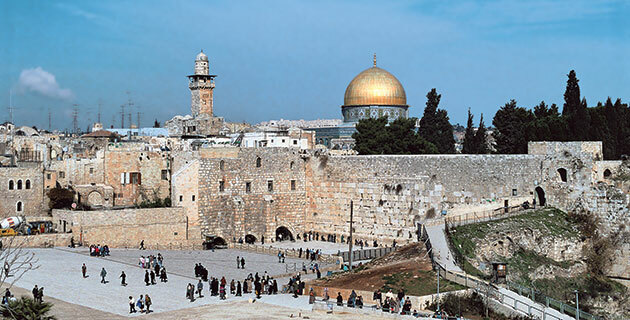 Montefiore’s masterful history of the Holy City focuses on the struggle between the Abrahamic religions and the place of prophets and patriarchs – including Abraham, David, Jesus and Muhammad – with grace and balance, tracing the story of Jerusalem through the lives of men and women. Petra’s history from the Stone Age to the Nabataeans (who constructed the city) through the Crusades is documented with 150 full-color photographs. This choice anthology includes excerpts from Oz’s celebrated novels and nonfiction. Colorful and compelling, this sharp-eyed portrait captures the diversity of modern Israel with humor and authority. 60th anniversary edition. Gilbert’s balanced, authoritative and well-illustrated survey includes historic documents, posters, letters and memorabilia. Starting with the First Zionist Congress in Basel in 1897, Gilbert charts the history of the Jewish state up to the present. A marvelously readable, far-reaching chronicle of three thousand years of Jewish history. Goldhill shows the layered, multi-religious history of the city through its architecture, organizing his exhilarating guide into a series of seven walking tours (each with map). A family saga and portrait, Oz writes of growing up in Jerusalem in the 1940s, his family’s origins and his life as a novelist and commentator. Big in scope, A Tale of Love and Darkness is, in part, the story of Israel and its people. In the follow-up to his acclaimed The Burma Chronicles (BMA58), Delisle uses the graphic novel format to recount the time he spent in East Jerusalem during the Gaza War. “Where you staying?” the Bedouin asked. “Why you not stay with me tonight – in my cave?” Thus begins the fascinating odyssey of a young nurse from New Zealand who would marry and raise her family among the community of 100 Bedouin families living in the ancient city of Petra. Organized geographically, these 16 stories by celebrated contemporary writers including Amos Oz, A.B. Yehoshua and David Grossman reflect the cultural diversity of modern Israel. Grossman’s haunting novel follows an Israeli mother as she walks across Israel to Galilee to avoid the “notifiers” who might arrive with news of her son’s death in a military offensive against the Palestinians. An outstanding guide to 700 species of the birds in the region from the Arabian peninsula to Egypt, Jordan, Lebanon, Israel, Syria, Iraq, Iran, Turkey and Cyprus. Second edition.